Have you seen the Giant? 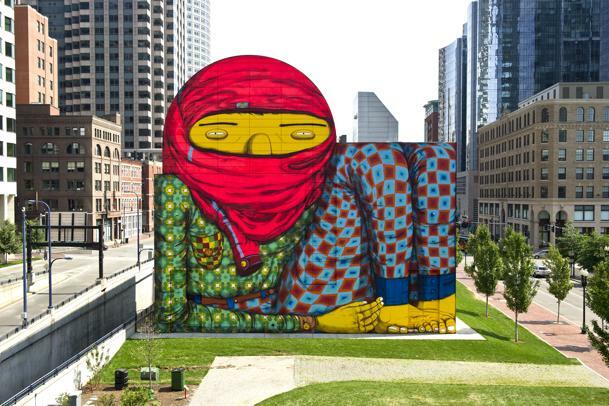 Brazilian twins/artist duo, Otavio and Gustavo Pandolfo, – Os Gemeos – have recently completed a graffiti style mural on Boston’s Rose Kennedy Greenway. The mural coincides with Os Gemeos first solo exhibit now open at the ICA. Their temporary 70’ x 70’ mural on the Dewey Square air intake will remain up at least through November 25 – also the end of the exhibition – and could possibly last as long as 18 months, depending how it survives Boston weather.